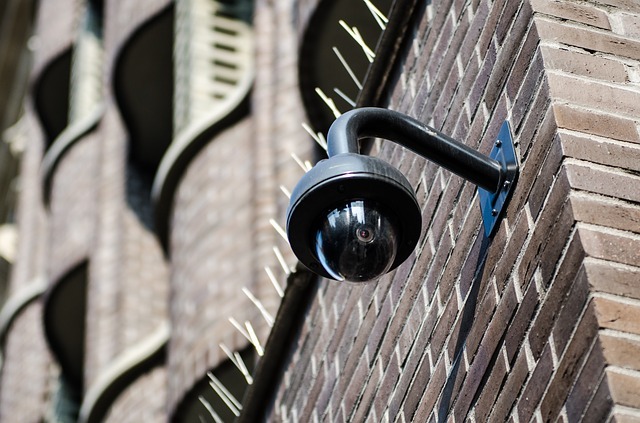 Whether it’s about protecting your home or any private property from prying eyes, there are two common types of systems used for video surveillance, IP Cameras and CCTV Cameras. While both the cameras are used basically for the same purpose, they differ in how they function to meet specific security needs. They are also the most common types of cameras used in surveillance system these days. An IP Camera, or Internet Protocol Camera, is a digital video camera used for surveillance and at the same time, captures and transmits data over a fast Ethernet link. CCTV, or Closed-Circuit Television, is a system in which the signals are closely monitored for surveillance and security purposes. We present an unbiased comparison between the two so you’d be able to make a smart decision on how to best protect your home or business. What is a IP Cameras? The applications of electronic systems for security purposes have changed dramatically over the years. Unlike CCTV cameras with television lines, digital IP cameras are the next generation of surveillance system developed for a CCTV environment, but with better image quality, better resolution, and more everything. They generate an image directly from digital data with no continuous stream of analog video being broadcasted. They are more like the digitized version of CCTV cameras but with multi-user support meaning multiple users can use the cameras on multiple devices, plus advanced control features and flexibility to add unlimited cameras to the network without the need of any proprietary hardware. The traditional CCTV cameras were primarily used for intrusion-detection applications mostly for alarm assessment purposes. That changed when solid-state cameras came to the picture in the mid-1980s and quickly became the standard for video surveillance because of their low maintenance cost and ease of use. Further advancement of technology and communication has pushed the limits of CCTV surveillance to an unprecedented level which results in an industry rich in computer and communication technologies. From an immature system to a full-fledge surveillance system, CCTV cameras has emerged as a standard for security industry. 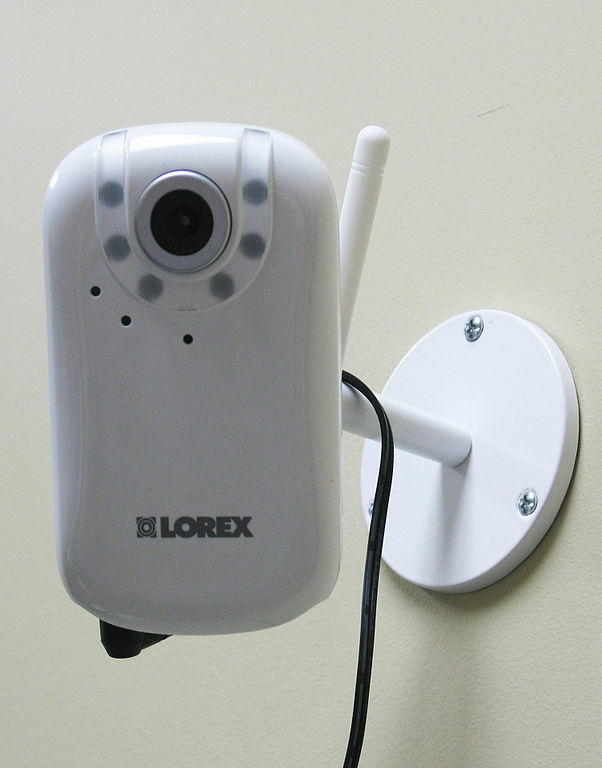 An IP camera is a networked digital video camera that transmits real-time video footage via a computer network and the internet. They are often used for IP surveillance, more like the digitized version of CCTV cameras with better picture quality and advanced recording functions. It is quickly becoming the standard for video surveillance. Closed-circuit television (CCTV) cameras, on the other hand, are used to transmit signal to specific place with a limited set of monitors within a closed system and is distinct from broadcast television. The network of CCTV cameras makes up a complete system. CCTV depends on strategic placement of cameras and monitoring of the video footage on monitors and closed observation of the input. The cameras communicate via monitors and video recorders. Videos are stored digitally using a physical digital video recorder (DVR) across private coaxial cables or wireless communication links. Remote viewing is possible when the DVR is connected to the internet. IP cameras are generally plug-and-play devices that use NVR (network video recorder) rather than a conventional DVR to store digital content, plus they can be used in conjunction with CCTV cameras to have hidden cameras to cover blind spots. Unlike analog CCTV cameras, IP cameras broadcast video footage as a digital stream of data over a computer network (LAN) or the internet to a network video recorder (NVR) through internet protocol. IP cameras need a connection to the same network as the NVR. They use PoE (Power over Ethernet) so that only one cable can be used for both power supply and video transfer eliminating the need for power cables. CCTV cameras send the video signal to DVR via coaxial cables, and the DVR then processes the signal for viewing. Unlike IP cameras, CCTV cameras require a direct link to the DVR. All the cameras in a CCTV system has to be placed in one location and the cameras require a direct connection to the base station or the DVR, so expansion of a CCTV system can be a whole lot pricey. Additionally, there’s only limited number of cameras that can be added to the network because a DVR is only able to accommodate up to 32 cameras, on the higher side and adding more cameras require an additional DVR. There’s no such limit on IP cameras and you can add almost any number of cameras to the network which would only require an additional storage without any major cost involved. The ease of use and reliability of IP cameras clearly outweigh the advantages of CCTV cameras on various grounds. IP cameras definitely offer significant advantages over analog cameras when it comes to surveillance which makes it worth your while to switch from analog to IP cameras. The initial cost can be a pressing issue, but it’s easy to understand that a single IP camera can easily replace many analog cameras in terms of functionality and scalability. The security camera industry continues to push the limits of picture quality and resolutions, thus use of IP cameras clearly takes the toll while analog is quickly becoming outdated. Sagar Khillar. "Difference Between IP Camera and CCTV." DifferenceBetween.net. 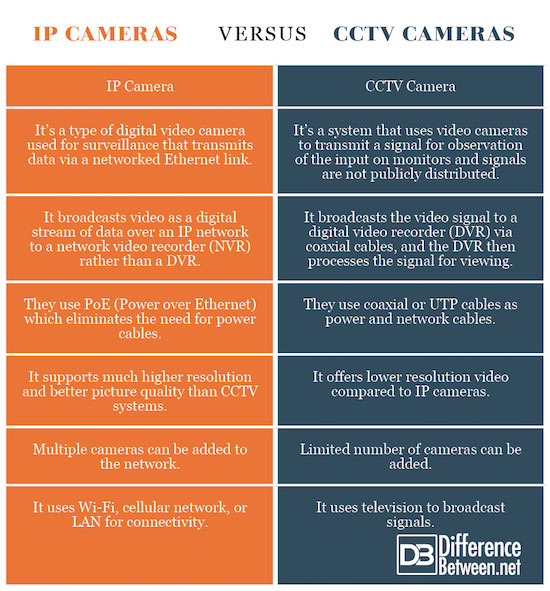 July 30, 2018 < http://www.differencebetween.net/technology/difference-between-ip-camera-and-cctv/ >.